I love this cover – it has a sense of mischief and fun and the Tiffany Aching books are certainly a whole lot of fun. 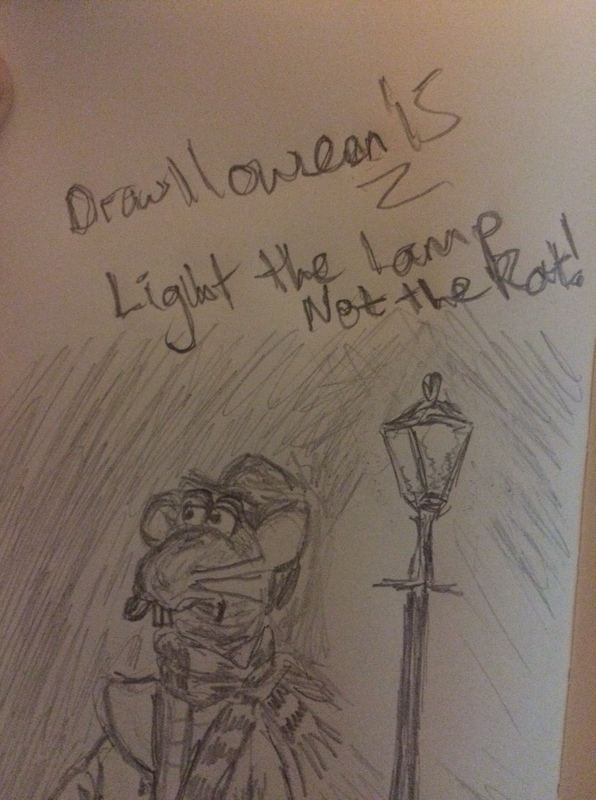 Today is day 25 of Drawlloween – a fun event that I found out about here on the lovely ‘Not Yet Read’. Today is Rat. Nobody likes rats, right? Well, maybe sometimes we do – what about this fella – and, in spite of my rough sketch – can you name the film? We’ve come to the end of the readalong, which is frankly a little bit sad. I’ve enjoyed spending time with Tiffany and the Wee Blue Men and will miss them. But, nae bother, onto the questions and if you haven’t read these books you definitely want to read no further. Well, now. It seems Letitia is much more than just a snivelly ‘princess in the tower’… What do you think of the way she handles the ghosts at Keepsake Hall? I thought it was great! She’s definitely a witch. She has that ‘caring’ thing down to a tee. On top of that I was impressed with that whole chapter. Letitia almost changed personalities when she was on her home ground and became a different person – it shows how out of water she was really feeling and how stressed with the whole ‘wedding’ thing. Not to mention, and don’t pelt me with rotten fruit – but even the Duchess came out of that scene looking kind of good! She looks after her staff in their dotage. Okay, she can be a bit of a mare but that was touching and definitely helped me to look at her with a ‘less frowny face’. “We do right, we don’t do nice…” Miss Smith turns up again – in another unusual way – and she’s got some eye-opening words for Tiffany here… Do you agree that Tiffany’s got to grow up a little more still, or should she just ask for help with the Cunning Man? I quite like that Tiffany wanted to sort this out by herself – even more so as it wasn’t all her own creating. I thought on the contrary it almost made her seem more grown up – she’s on her own turf, erm, chalk, and she’s taking the responsibility. And, okay, things could have gone wrong but she has pride in herself which as she said isn’t necessarily bad. Preston earns even more trust from Tiffany, and she makes an interesting point about whether or not the Cunning Man will be dangerous to him… Do you think the two of them can take him on? I really like Preston even more now I’ve finished! To be honest it never occurred to me at the time just how terribly wrong it could all go – I suppose the Cunning Man could have tried to overtake Preston’s body just the same as the man in the jail and being worn as a suit by Dr Evil doesn’t sound like much fun to me. But, Tiffany seemed to think he was safe so I did also. Speaking of taking on the Cunning Man, he’s getting closer – and in a very alarming way. This is certainly different, and it’s keeping Mrs Proust involved. Do you think she might be the exception to the “kindly assistance” rule among witches? It certainly seems that way. She made an enormous effort to reach Tiffany and warn her about the Cunning Man having acquired a body – and all the witches managed to get on together when they finally met. It was like a standoff. O-ho, so the Duchess has a secret of her own… Are you surprised? I’m not surprised that she had a secret – you could tell her behaviour was wrong. But I hadn’t figured it was about being a dancing girl! It certainly brought her down a peg or two although I don’t know why she was so scared about it all coming out – it’s not exactly the end of the world and perhaps she would have been able to remove the ramrod from up her backside and get on with people in a normal fashion if she wasn’t so scared people would find out. I guess the whole hint about all her family being dead was a giveaway – they were probably all still alive! Tiffany defeats the Cunning Man! What did you make of this scene? I didn’t really figure out what her plan was – right up to the end – Okay, I could tell she was running into the fire but I kind of thought she’d do that transference thing (although it’s not like she had a bucket of water handy so DOH!) I liked that she used the whole harking back to the ancient wedding ceremony trick with the language and all – although I wondered why she was calling Letitia names and I thought it was cool that in actual fact she did really have help through the use of time travel – but actually helped herself. I loved that all the little odds and ends were worked out. Amber, Letitia, Preston – even the Feegles being handed the land which the mound sits on. Also – I loved the use of the Macbeth line! I could definitely do with some more Tiffany reading material so side note to Mr Pratchett – if you want to write any more – or just the Feegles all by themselves – nae problemo, I’ll be there.